Make way for the Burgman 650. Control has never come so freely. Power has never flowed with such ease. Every movement feels smooth and graceful. Every street is yours for the taking. The Burgman 650 delivers performance with as much control as you desire. A liquid-cooled 638cc engine offers all the power you need. Computerised fuel injection, a Pulsed-secondary AIR-injection (PAIR) system, and an O2 feedback system with catalyser boost fuel efficiency and minimise emissions. A tubular frame and aluminium swingarm combined with the engine position provide optimum balance and agility. The frame inherits the confidence inspiring wheelbase of earlier Burgmans for a sporty, controllable ride and has a newly designed, slimmer tail section for sleeker, sportier bodywork. 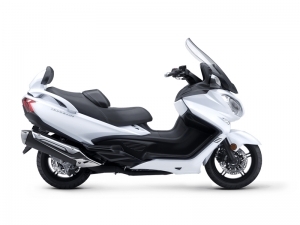 The Burgman 650 is equipped with a range of our advanced rider technology, Suzuki Advance Immobiliser System, Heated Grips, Heated Seats and a Powered Windscreen. Big, easy-to-read analogue dials for the speedometer and tachometer flank a digital display that includes; odometer, twin trip meters, average fuel consumption, fuel gauge, clock, oil level indicator, oil change indicator, drive mode indicator (for Drive and Power modes) and a gear position indicator (for Manual mode).